Until the 16th century, Venetians preferred to call their palaces casa or ca' no matter how grandiose, reserving the word palazzo only for the residences of the doge and patriarch. Today the names are often used interchangeably. To add to the confusion, some houses have several names, in a chain of former owners (although three names seems to be the maximum allowed). Often palazzi with the same name family name have a geographical suffix to tell them apart. Or not. 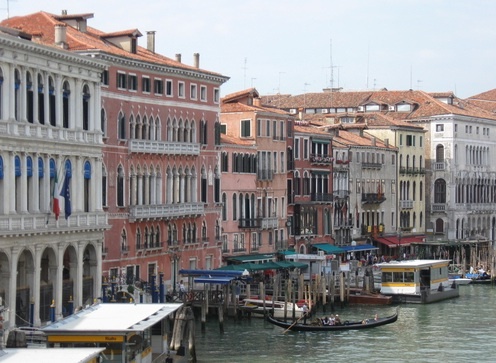 Unlike most Italian cities, Venice had no native stone, but also, unlike most Italian cities in the Middle Ages, Venetian nobles didn't have to build themselves castles and towers to protect themselves from each other or their fellow citizens. All merchant vessels were expected to bring back stone with them as ballast. White Istrian limestone, polished to look like marble, adorns the grander facades; other walls are generally made of brick, faced with a thin veneer of marble or stucco. Most Venetian palazzi, starting with the Veneto-Byzantine survivors such as the Ca' Mosto, have had numerous alterations over the centuries. Yet nearly all have kept the same plan, serving several functions: as a residence, a showcase for a family's wealth and sophistication and place of doing business. Only in the late 15th and 16th centuries, as Venice became more imperious, more 'Roman', more interested in real estate than in trade, did the patricians seriously begin tarting up their abodes, hiring the greatest artists of the day to decorate facades with frescoes (all sadly lost), coloured marbles, mouldings, fancy capitals and even gold leaf. Stylistic peculiarities are not unknown, as in the Palazzo Contarini del Bovolo with its unique exterior spiral stair (1500), said to have been designed for the owner's horse. Styles by then had changed, notably with the construction of Palazzo Loredan Vendramin and Palazzo Corner Spinelli by Mauro Codussi. Another major influence was the design books and especially the elegant serliana tripartite window designs of Sebastiano Serlio. A third influence, harking back to the monumentalism of classical antiquity came from Renaissance Rome, in the person of Jacopo Sansovino, especially in his Palazzo Corner (Ca' Grande). Venice's best Baroque palazzi are now all museums, offering a chance to visit their interiors: Ca' Pesaro and Ca'Rezzonico, both by Venice's greatest Baroque architect Baldassare Longhena, and Palazzo Grassi by Giorgio Massari. The ornate Rococo Palazzo Labia (1750) marked the grand finale of big palazzo building. In the 19th century, the story changes to preservation and conversion, as many found new roles as government offices, museums, schools, hotels and holiday flats, although a few ancient families (for instance, the Zenos) still hang on to their ancestral digs.